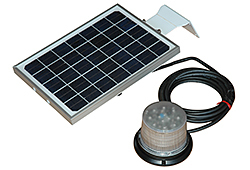 The SPLED-CL1B-M Class 1 LED beacon is solar-powered and offers 30 different strobing flash patterns. Powered by a 14.3-volt lithium poly battery recharged via the included solar panel assembly, the beacon is visible for over a mile and can run for over five hours on a full charge. Magnetically mounted.